It is my lovely friend Taru’s birthday – she of the Marsden Jazz Festival and many other projects. I didn’t know what to get her and finally decided on a stitched gift. 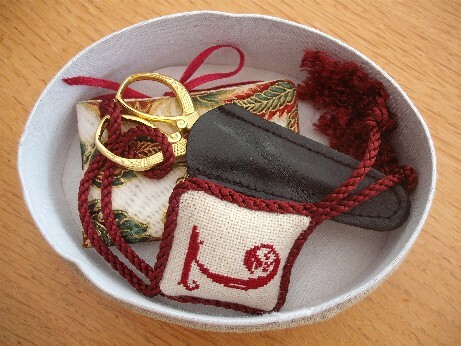 Taru doesn’t embroider but I reckon everyone has to mend at some point or another so thought I would make her a little box of sewing tools. The box comes from the Viking Loom in York and they have an online order service through their catalogue . The boxes come in linen or satin in various colours, sizes and shapes (including a heart shaped one) and have removable padded lids and lid inserts which you can cover with stitching or fabric. 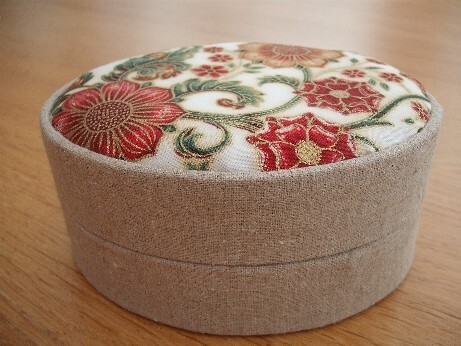 Another good source of containers for stitching gifts is Sew and So who sell the Framecraft metal and ceramic trinket boxes with padded lids that I have used in other projects. For both lid and insert I cut an oval of fabric, stitched it securely to the lid inserts’ lining fabric and used double-sided tape to secure back to the box. 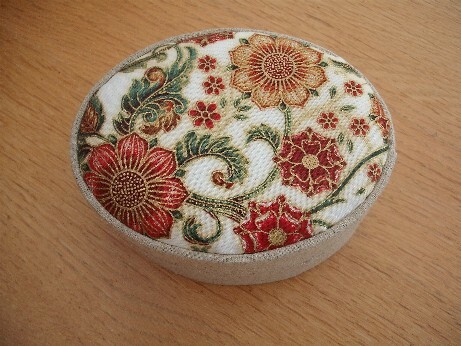 This means that both top of lid and the insert can be used as pin cushions making them ideal stitching gifts. I picked up this fabric at the Harrogate event last year I think, was attracted by its medieval patterns and it has sat in my stash ever since waiting for a suitable project. At some point later, I forget from where, (so much fabric buying happens in my life!) 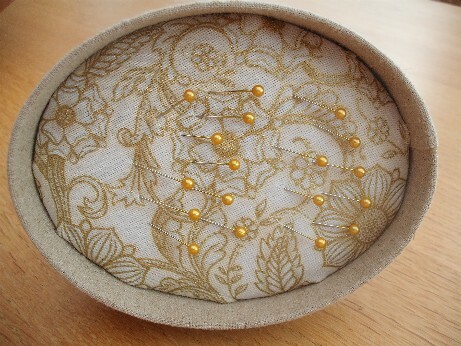 I found the same print in a different colourway with just gold which is what I have used for the inside of the lid. The fabric is by a supplier called Robert Kaufman and I have just discovered that they have a website, that could be damaging to the purse! I can’t find this fabric listed but they may still sell it and they also have lots of free quilt patterns! 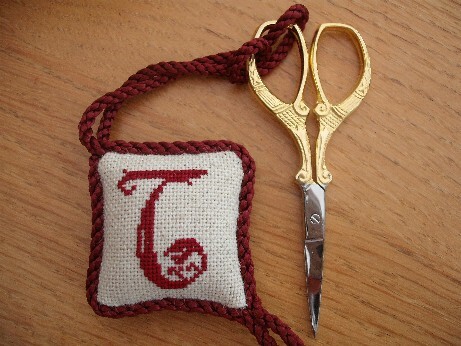 Inside the box is a pair of scissors with a scissor keep attached and a needlebook. The scissors I got from the Harrogate event last year again – I usually buy several pairs when I go as they make excellent gifts and buying them in bulk at the shows you get a special price which makes them about a quarter of the cost. For the scissor keep I did my usual design with a slight alteration to the braid – this particular braid really frays so rather than trying to sew it up to stop it fraying I left two long ends and made tassels which seemed to work better. The ‘T’ initial is from a Celtic alphabet set that I printed from the internet some time ago – sorry due to all the technical issues I have had with PCs recently (solved thanks to lovely daughter’s old laptop) I don’t have the details of where it came from. 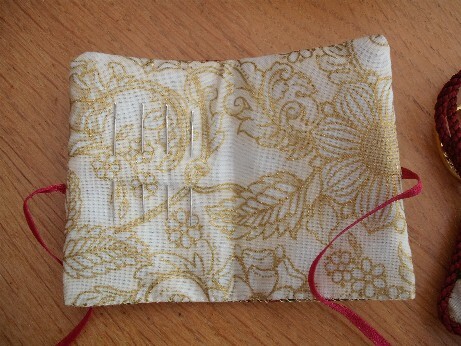 I made the needlebook by using the two fabrics and putting a piece of wadding in between so that you have a place to put the needles – I prefer that to putting flannel or felt in as you can see the lining fabric. The back of the scissor keep is the Florentine fabric again. I really enjoyed making this and I hope she likes it – and all of this was from my stash – just shows the value of buying things you might need one day! Yes she did and she loved the fabric – I love the fabric too – hoping I can get some more of it at Harrogate this year. That’s ok – I put in the link as when I was first looking for boxes because I saw a completed one in a magazine I couldn’t find any at first so thought it might help someone else. 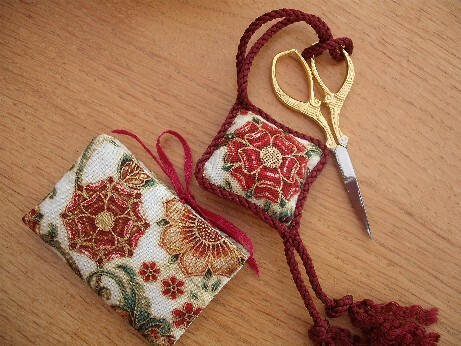 What beautiful things you’ve made Alison – I love all the fabrics you’ve used. I too have a box from Viking Loom waiting to have the top covered or embroidered – must get started on it now you’ve given me lots of ideas! ooooooo………I have a friend going to Harrowgate. I’ve just mailed her to ask her to keep an eye out for some “Florentine” for me – I Soooooo want some! I will keep a look out as well – if I do see it I will get supplier’s details and post them on the blog so if your friend doesn’t find it you can contact them direct.